Driving through DTLA in 2011, I saw what I thought was a painted mural on the exterior wall of an old brick building. I didn't realize till I was nearly passed that the image was really a bas-relief, carved into the brick itself. I was able to grab this photo below. 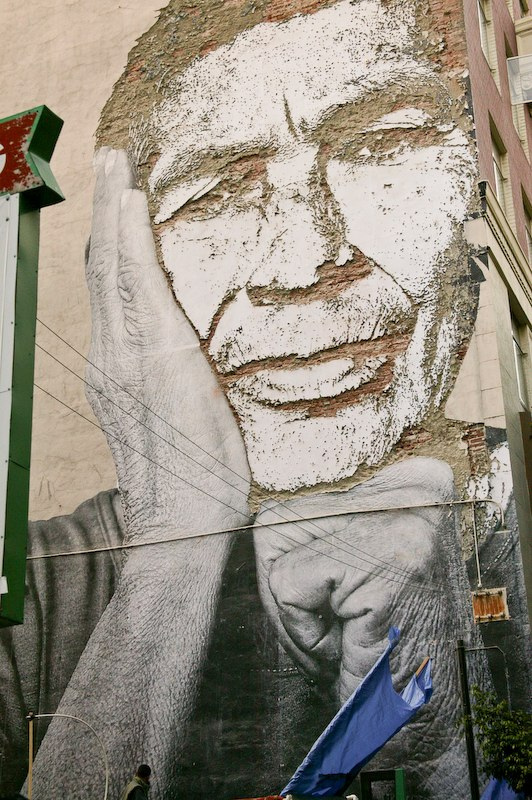 Recently, I learned that the artist was Portuguese artist Alexandre Farto, known by is street name of Vhils. He has an installation show in Los Angelesuntil the beginning of April. Though I enjoyed his exhibition, his outdoor work is still amazing to see IRL. You can see my pictures from the exhibit here.